Last week, this pair opened with a massive gap-up, which also happened on other EUR pairs. Price managed to reach the resistance line at 1.0950, and then consolidated till the end of the week. The gap-up has forced a bullish bias to appear, but this may not last long because EURUSD are expected to become weak this week. While there are resistance lines at 1.1000 and 1.1050, the support lines at 1.0900, 1.0850 and 1.0800 could be tested this week. USDCHF is in a short-term bearish mode, and price consolidated last week in the context of that short-term bearish mode. Within the last several days, price has not been able to move above the resistance level at 1.0000 or below the support level at 0.9900. A movement above the resistance levels at 1.0000 and 1.0100 would result in a Bullish Confirmation Pattern, while a movement below the support levels at 0.9900 and 0.9800 would reinforce the existing bearishness in the market. Last week, price consolidated from April 24 to 26 and then resumed its upwards journey, which was started on April 10 (although the most significant bullish movement occurred on April 18). The distribution territory at 1.2950 was tested on Friday before the market closed. Since April 10, price has gone upwards by 570 pips, and this is just the beginning, because there is a strong Bullish Confirmation Pattern in the market, and because the outlook on GBP pairs is also bullish for May. There may be some bearish attempts, but the bullish bias might survive till the end of May. USDJPY also opened with gap-ups at the beginning of last week, just as other JPY pairs did. The gap-up forced a bullish signal to form as price went further upwards, testing the supply level at 111.50. The bullish bias might hold for a few more days, (reaching the supply levels at 112.00, 112.50 and 113.00 at most), but the outlook on USDJPY is bearish for this week and this month. A major pullback would eventually happen. Last week, the market opened with an upward gaps, which was not filled because price even went further upwards on Tuesday, almost testing the supply zone at 122.00 and consolidating till the end of the week. This cross might go upward a bit further; though there is a high probability of strong selling pressures occurring this week and this month, which would override the current bullish signal. The outlook on JPY pairs is seriously bearish for May. However, when we discuss how you will garner your mental and emotional resources in order to become consistently successful, profit (in any one trade) is not where you want your focus to be. Profits come as a result of “probabilities” over a series of trades. In fact, profit can be a major distraction and the cause of erratic behaviors that beget unwanted results. Let’s face it, results, consistent positive results, are what you want.Tweet: Let’s face it, results, consistent positive results, are what you want. Anything else is unacceptable. So, your main trading trajectory must encompass this reality. Consistently successful trading requires a laser focus on what-matters-most; alignment of body, mind and emotions; and an ability to be truly disciplined, for starters. Honing your trading process and the focus of your trades. Free Trading WorkshopActually, you want to approach the trading process with your eyes wide open and embracing the fact that any trade can lose, and some will. No matter how strong your strategy, you must accept the randomness of the markets and therefore be very serious about protecting your capital; in other words, using and relying on your stops. In this way, you will begin to manage your fear…a very important skill. AIG shares (NYSE:AIG) have been trending downwards in the past few months. There is a bearish bias on the market as shown by the analysis in the chart, although price may soon go upwards. The ADX period 14 is not above the level 30, showing a current lack of momentum in the market. The DM+ also is intertwined with the DM- (another evidence of lack of momentum in the market). The MACD, default parameters, has its signal lines below the zero line, while its histogram is currently above the zero line. There are mixed signals in the market, and it may be OK to stay aside until there would be a directional movement. AIG would soon begin trending seriously and coming months would show whether price would be going upwards or downwards. Nokia stock (NYSE:NOK) is now a bull market. Price has currently gapped up, showing a serious bullishness in the market. Price is above the EMA 21, and the Williams’ % Range period 20 has gone into the overbought territory. While there could be weak and transitory pullbacks along the way, the overall market movement would be bullish for this year. Since December 2016, Nokia has been trending upwards (though there was some bearish correction in January 2017); and this is a trend that is expected to continue. Epay (Epay.com) e-currency is the latest wonder of the financial world. Perfect and excellent. 2. Epay has been authorized and licensed by Chinese government and Hong Kong government to do online payment business. 3. Epay world office is located in Nanshan District, Shenzhen, in southeastern China, which is a modern metropolis that links Hong Kong to China’s mainland. Shenzhen is in Guangdong Province, which is one of the five largest and wealthiest cities of China. 4. Epay supports Nigerians without any restrictions. They also welcome USA citizens. 5. Epay supports USD, GBP, EUR and HKD. 6. Epay account opening and verifications are free and very easy. Once you’re verified, you can use the account for life. 7. You can enjoy unlimited transfers per transaction, per day, per week and per month, using Epay. 8. Epay to Epay transfer is free. You don’t bear any costs to transfer Epay to another member; or to receive Epay. No other e-currencies providers allow this. 9. Epay fully supports exchange business. 10. You can fund your Epay wallet with Bitcoin free of charge, and sell it to make money. 11. You can fund your Epay wallet with WesternUnion free of charge, and sell it to make money. 12. You can fund your Epay wallet with Money Gram free of charge, and sell it to make money. 13. You can fund your Epay wallet with Wire Transfer free of charge, and sell it to make money. 14. You can fund your Epay wallet with Ria Money free of charge, and sell it to make money. 15. You can fund your Epay wallet with Webmoney, and sell it to make money. 16. You can fund your Epay wallet with OKPAY, and sell it to make money. 17. You can fund your Epay wallet with Payeer, and sell it to make money. 18. You can fund your Epay wallet with Perfect Money, and sell it to make money. 19. You can fund your Epay wallet with Paypal, and sell it to make money. 20. You can fund your NETELLER wallet with Epay. 21. You can withdraw Epay through Wire Transfer directly into your domiciliary account, with very low fees. 22. You can withdraw Epay via Western Union or Money Gram. Very low fees. 23. You can withdraw Epay through other e-currencies listed above. Very low fees. 1% in most cases. 24. 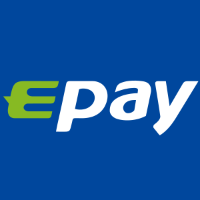 You can use Epay for online payments. 25. You can create virtual cards with Epay. Virtual card is anonymous that can protect your privacy. These cards can be used to make online payment. 26. Ituglobalfx.com.ng, the fastest-paying exchanger in Nigeria, accepts Epay. This means you can now sell Epay to them and get paid as fast as you can imagine. 27. Epay is now one of the fastest ways to send money to Nigeria, especially when dealing with the fastest-paying exchanger like Ituglobalfx.com.ng. 28. You can even do Epay transactions with ituglobalfx.com.ng when everyone is sleeping in the dead of night, on weekends (including Sundays), and during public holidays. 29. From Ituglobalfx.com.ng, you would also benefits from occasional free cash and recharge cards as an Epay account holder. 30. More opportunities are coming with Epay, like more brokers adopting the e-currency. It’s good for the opportunities to meet you ready. 31. Speaking about the advantages of Epay.com we would also like to mention a very clear referral program. It doesn't matter how much a person you brought spends and it doesn't matter if this person spends at all – you get your $5 anyway. The maximum referral reward is $5000 for 1000 new users you brought. Looks decent! 32. Don’t underrate Chinese business. Amazon.com (founded in USA) is 22 years old and Ali Baba (founded in China) is 18 years old. But last year, Ali Baba made a net income that was more than 10 times bigger than the net income made by Amazon. Ali Baba has also grown far and far bigger than Amazon. It’s better to look into the future and see very bright prospects. That’s Epay. It got a very bright future and you’ll do well to join the ride before the competition becomes stiff. Please strike while the iron is hot. Sometimes, all your career needs is a little luck–even if you have to make it yourself. 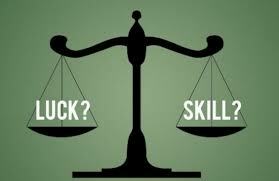 Here’s a realistic look at skill, luck, and what you can do to change your odds. In the mid 1970s, he founded a company to sell software for micro-computers. In the early history of the company, “the atmosphere was zany,” and “people came to work barefoot, in shorts,” and “anyone in a suit was a visitor.” But the company was soon highly profitable, and by 1981 its operating system had a dominant share of the market for personal computers that used Intel microprocessors. For all of its early triumphs, the company’s watershed moment came when IBM visited in the summer of 1980 to discuss an operating system for its new PC. After some negotiation, the two companies struck a deal. In August 1981, retailers offered the company’s software alongside the brand new IBM PC, and the company’s fate was sealed. The rest is history, as they say. In case this story’s not familiar, here’s the ending. This pioneer of computer technology entered a biker bar in Monterey, California, on July 8, 1994, wearing motorcycle leathers and Harley-Davidson patches. What happened next is unclear, but he suffered a traumatic blow to the head from either a fight or a fall. He left under his own power but died three days later from the injury, complicated by his chronic alcoholism. He was fifty-two years old. He is buried in Seattle and has an etching of a floppy disk on his tombstone. His name is Gary Kildall. You’d be excused for thinking that the first part of the story is about Bill Gates, the multibillionaire founder of Microsoft. And it is certainly tantalizing to ask whether Gary Kildall could have been Bill Gates, who at one point was the world’s richest man. But the fact is that Bill Gates made astute decisions that positioned Microsoft to prevail over Kildall’s company, Digital Research, at crucial moments in the development of the PC industry. When IBM executives first approached Microsoft about supplying an operating system for the company’s new PC, Gates actually referred them to Digital Research. There are conflicting accounts of what happened at the meeting, but it’s fairly clear that Kildall didn’t see the significance of the IBM deal in the way that Gates did. IBM struck a deal with Gates for a lookalike of Kildall’s product, CP/M-86, that Gates had acquired. Once it was tweaked for the IBM PC, Microsoft renamed it PC-DOS and shipped it. After some wrangling by Kildall, IBM did agree to ship CP/M-86 as an alternative operating system. IBM also set the prices for the products. No operating system was included with the IBM PC, and everyone who bought a PC had to purchase an operating system. PC-DOS cost $40. CP/M-86 cost $240. Guess which won. But IBM wasn’t the direct source of Microsoft’s fortune. Gates did cut a deal with IBM. But he also kept the right to license PC-DOS to other companies. When the market for IBM PC clones took off, Microsoft rocketed away from the competition and ultimately enjoyed a huge competitive advantage. Preparation and hard work are essential elements of skill. They often lead to good outcomes. But the aphorisms don’t really address what’s happening. If you prepare and work hard, you are successful not because your luck improves. Luck doesn’t change at all. Only your skill improves. And you can work hard and prepare and build the best American diner on Route 66 just when the Interstate highway bypasses your town and puts you out of a job. There’s another popular argument that says you can’t get lucky unless you get in luck’s way. For example, you can’t win the lottery unless you play. On one level, of course, this is true. But it glosses over two important points. Luck can be good or bad. While winning the lottery does seem like good luck, it’s hard to say that losing the lottery is bad luck. Losing the lottery is expected. 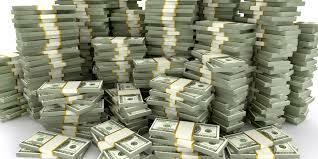 Lotteries are designed to take in more money than they dole out, so they are a loser’s game in the aggregate. The main issue is that putting yourself in a position to enjoy good luck also puts you in a position to lose. The other point is that the very effort that leads to luck is a skill. Say that you need to complete ten interviews with prospective employers to receive one job offer. Individuals who seek only five interviews may not get an offer, but those who go through all ten interviews will have an offer in hand by the end of the process. Getting an offer isn’t luck, it’s a matter of effort. Patience, persistence, and resilience are all elements of skill. Wiseman collected a sample of hundreds of individuals and had them rate themselves on their beliefs about luck. He then sought to explain “the different ways in which lucky and unlucky people thought and behaved” and identified the “four principles of luck.” The principles include maximizing your chance opportunities, listening to your lucky hunches, expecting good fortune, and turning bad luck into good. Wiseman’s research is unfailingly lively and provocative and he comes across as an energetic and intellectually curious man. Unfortunately, good science this is not. In one experiment, Wiseman asked people playing the U.K. National Lottery to submit a form that included information on how many tickets they intended to buy and whether they considered themselves lucky. Of the seven hundred–plus respondents, 34 percent considered themselves lucky, 26 percent unlucky, and 40 percent were neutral. Thirty-six of the respondents (about 5 percent) won money that night, split evenly between the lucky and unlucky people. Individuals lost £2.50 on average, just as you would expect according to the number of tickets purchased. Wiseman points out that this experiment shows that lucky people aren’t psychic (just in case you thought they were); he also rules out any relationship between intelligence and luck. Suffice it to say that there is no way to improve your luck, because anything you do to improve a result can reasonably be considered skill. 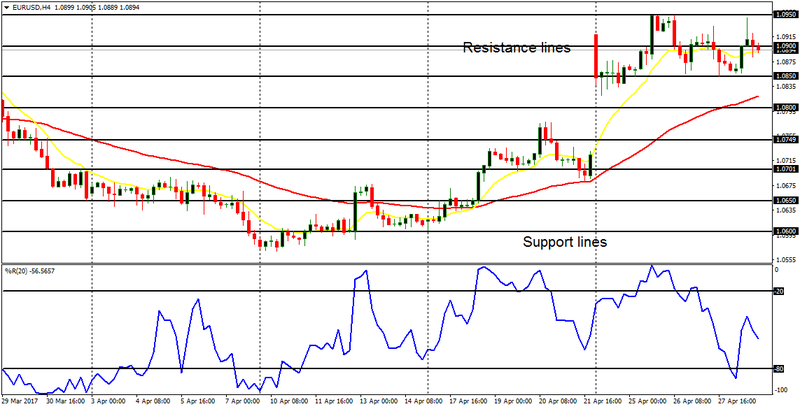 The EUR/USD went upwards last week, reaching the resistance line at 1.0750. The upwards movement was not significant enough to bring about a Bullish Confirmation Pattern in the market, unless the resistance line at 1.0800 is breached to the upside. The bearish correction that was experienced on Friday may bring good opportunities to go long at better prices, because the EUR/USD, as well as other EUR pairs, is expected to go further upwards this week. 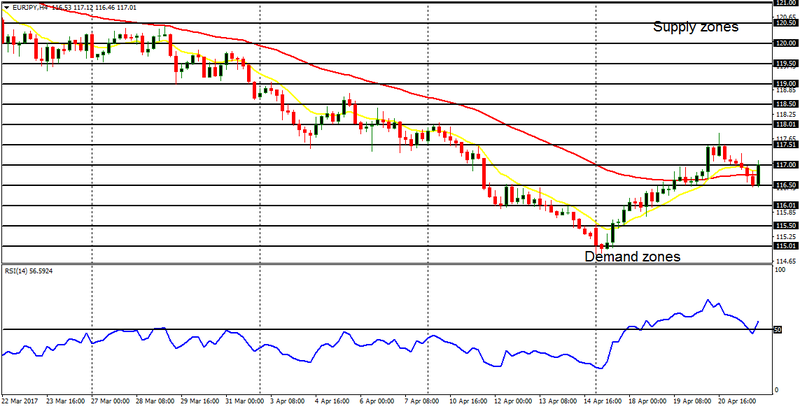 EUR/USD: The EUR/USD went upwards last week, reaching the resistance line at 1.0750. The upwards movement was not significant enough to bring about a Bullish Confirmation Pattern in the market, unless the resistance line at 1.0800 is breached to the upside. The bearish correction that was experienced on Friday may bring good opportunities to go long at better prices, because the EUR/USD, as well as other EUR pairs, is expected to go further upwards this week. USD/CHF: This currency trading instrument is neutral in the long term, and bearish in the short-term. This month, price has generally moved between the support level at 0.9900 and the resistance level at 1.0100. Movements above the psychological level at 1.0000 would cause short-term bullish signals, while movements below it would cause short-term bearish signals. For a directional bias to form in the long-term, there is a need for price to, either move above the resistance level at 1.0100 or below the support level at 0.9900. 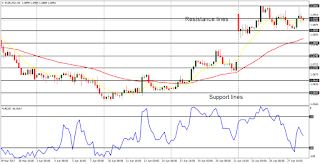 GBP/USD: The GBP/USD moved upwards by some 370 pips last week, testing the distribution territory at 1.2900, before price moved sideways till the end of last week. 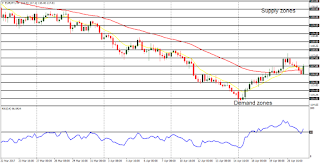 The sideways movement is merely a pause in the bullish journey; for momentum is expected to rise this week, pushing price towards the distribution territories at 1.2850, 1.2900 and 1.2950. The outlook on other GBP pairs are also bearish. EUR/JPY: In the context of a downtrend, this cross pair rose from the demand zone at 115.00, and reached the supply zone at 117.50 (a movement of 250 pips). Price got caught in some bearish retracement on Friday, and since the outlook on JPY pairs is bearish, what happened last week may bring nice opportunities to go short at better prices. This week, the cross could reach the demand zones at 116.00, 115.50 and 115.00.